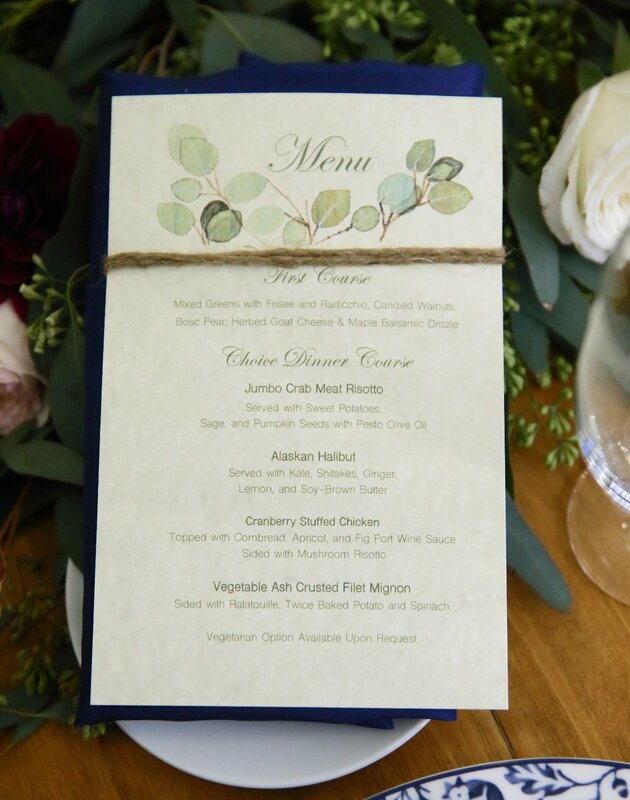 This elegant menu was crafted by our event specialist Ashley for a client who wanted to bring the beauty of nature into their corporate ballroom! Choose your party theme or inspiration. In the case of this party, our client chose a whimsical woodland theme; therefore, our event specialist was inspired to incorporate an array of greens - moss, laurel, artichoke, and olive - and brown colors into the event and menu design. (The menu items were also selected in alignment with this theme). Pair your favorite calligraphy (for the headers) with a modern sleek font (for the menu items and descriptions) to generate a restaurant style menu for your guests. Add some clipart via Google or Microsoft Office for a touch of color and elegance. Consider printing your menus on card stock paper. For this particular menu we utilized textured linen card stock. For the final touch, wrap your menus in twine twice to reinforce the forest nature theme.